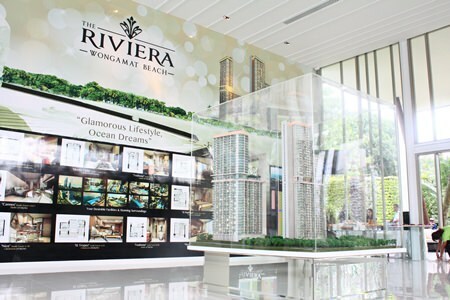 Pattaya’s most recent high-profile and glamorous high-rise development ‘The Riviera’ held an opening weekend event on Sat 30th Nov and 1st Dec at the all new luxury showrooms on Soi 16, Wongamat. The special guests attending included Pattaya Deputy Mayors Ronnakit Ekasing and Wuttisak Rermkijakarn, Banglamung Assistant District Officer Natthana Leejiavara and Commander Pol.Maj.Gen Ittipol Ittisarnronnachai. Developer Winston Gale (4th right) and wife Sukanya (3rd right) greet Pattaya Deputy Mayors Ronnakit Ekasing and Wuttisak Rermkijakarn, and Pol. Maj. Gen. Ittipol Ittisarnronnachai plus other VIPs at the Open House party on November 30. Developer of The Riviera, Winston Gale commented: “We have had an excellent result from this weekend selling over 100m THB of property with many more units under consideration. We have been extremely busy over the last 8 weeks opening up for sales without an official showroom launch and so are delighted to announce that we have now exceeded 50% of total sales”. 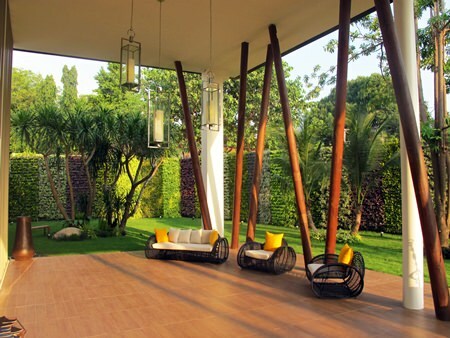 Stunning landscape detail surrounds The Riviera showroom. The previous week saw Winston and his Riviera Group team hold an exclusive agents-only ‘sneak preview’ at the luxury showrooms where more than 150 local agents attended to give their feedback before the show suite was opened to the general public. Kamonrat “Emmy” Ladseeta – the new brand ambassador for The Riviera. The showroom can only be described as ‘spectacular’, due in large part to the high level of sophisticated design, luxury fittings and details, combined with the overall scale of the building, which is actually only a temporary structure and will be removed 3 years from now. The company’s strap line of ‘Glamorous Lifestyle, Ocean Dreams’ is well reflected within the show-units and show gallery. Two fashions show’s provided extra glamour and sparkle on the opening weekend, with Bangkok’s EM Modelling Management providing international models that presented designer luxury clothing items from Erica Ernst ZuckerBraun Design and her team. Ladies from EM Modelling pose for a photo with Winston Gale and his wife Sukanya. Anders and his News Steaks & Grill team were on hand to provide high quality canapés, BBQ and a range of cocktails, and JoJo from Ministry of Dance imbued Sunday evening with some high-energy glamour in the form of salsa dancing with his experienced team. A live acoustic band played throughout the event on the terrace surrounded by what can only be described as a living wall of landscaping. 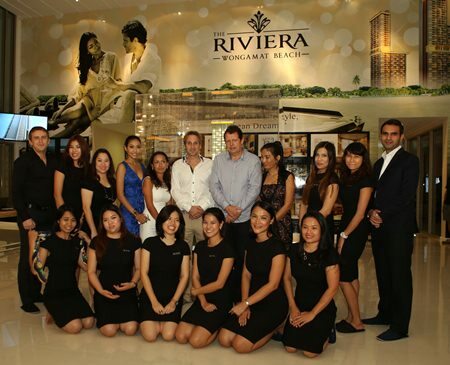 Winston Gale and his sales team welcome you to The Riviera at Wongamat. The Riviera will consist of two towers of 43 and 40 floors housing 979 units in total with an estimated value of 3.4B THB. 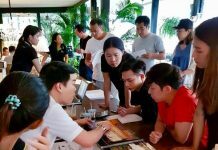 By scale alone, it makes it one of the most significant and important projects for Pattaya’s real estate market today and its hugely successful and rapid 50% of sales shows that Pattaya’s real estate market still remains in a healthy position. 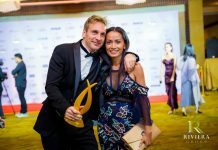 The Riviera’s success comes quickly off the back of Winston’s co-developing award for the ‘Best Eastern Seaboard Condominium’ 8 weeks ago for ‘The Palm, Wongamat Beach’. For more information, go to website: www.therivierapattaya.com.